← America’s Second Favorite Lesbian is Back on the Market! Jurassic Park is 20 Today. Do you hear me humming? Da da daaa da da, da da daaa da da, da da da, da da da, dada daaa da da? What is that tune, you ask? HEATHENS, all of you. IT IS THE JURASSIC PARK THEME SONG. Duh. You’ve really hurt the dinosaur’s feeling! And WHY would I be singing this sweet song? Uh, only because today marks the 20th anniversary of the release of Jurassic Park in the theaters. Double duh, heathens. I will never forget where I was on Friday, June 11, 1993. After a taxing day as an eighth grader at North Andover Middle School, my friend Laurie’s mother drove Laurie and me to Showcase Cinemas in Lawrence to watch this monumental event BY OURSELVES. Opening night baby! The theater was packed and the energy was electric. There was no tweeting, no texting, just a bunch of people nibbling on their popcorn and sipping their sodas. Glorious. The movie was PG-13. No big deal, I thought. But I will admit it was SO SCARY. And after the film, I was all, they better NOT decide to clone dinosaurs! I ended up seeing the movie two more times in the theater, including once as part of a Sleepless in Seattle double feature. Oh yes, it was the early ’90s, when the only thing that reigned more than dinosaurs was Meg Ryan and Tom Hanks on screen. So tell me about when YOU saw Jurassic Park. Did it change your life? Share in the comments! And let’s take a trip down memory lane. 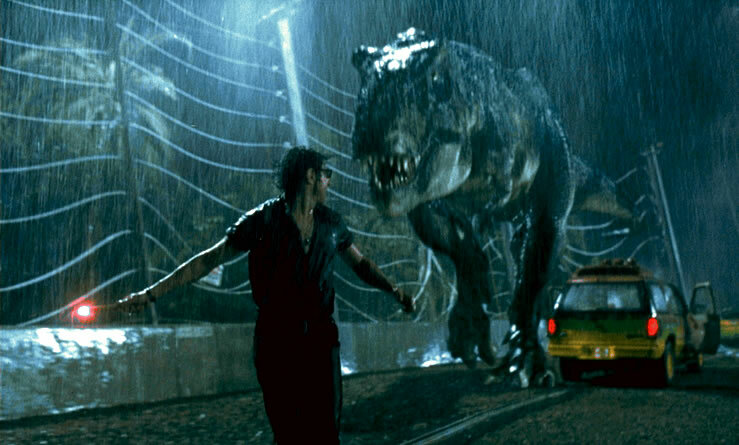 1 Response to Jurassic Park is 20 Today.